Album This song officially appears on the Please Please Me (Mono) Official album. “I Saw Her Standing There” is a song written by John Lennon and Paul McCartney, and is the opening track on the Beatles’ debut album, Please Please Me, the United Kingdom by Parlophone on 22 March 1963. In December 1963, Capitol Records released the song in the United States as the B-side on the label’s first single by the Beatles, “I Want to Hold Your Hand“. While the A-side topped the US Billboard charts for seven weeks starting 18 January 1964, “I Saw Her Standing There” entered the Billboard Hot 100 on 8 February 1964, remaining there for 11 weeks, peaking at #14. The song placed on the Cashbox charts for only one week at #100 on the same day of its Billboard debut. In 2004, “I Saw Her Standing There” was ranked #139 on Rolling Stone’s list of the 500 Greatest Songs of All Time. The song was a Lennon and McCartney collaboration based on McCartney’s initial idea. Originally titled “Seventeen“, the song was apparently conceived by McCartney while driving home from a Beatles’ concert in Southport, Lancashire as a modern take on the traditional song As I Roved Out, a version of Seventeen Come Sunday that he had heard in Liverpool in 1960. The song was later completed at his Forthlin Road home with Lennon. McCartney later described in Beat Instrumental how he went about the song’s composition: “Here’s one example of a bit I pinched from someone: I used the bass riff from ‘Talkin’ About You’ by Chuck Berry in ‘I Saw Her Standing There’. I played exactly the same notes as he did and it fitted our number perfectly. Even now, when I tell people, I find few of them believe me; therefore, I maintain that a bass riff hasn’t got to be original“. The lyrics were written on a Liverpool Institute exercise book. Remember, a book by McCartney’s brother Mike McCartney, includes a photograph of Lennon and McCartney writing the song while strumming guitars and reading the exercise book. It was typical of how Lennon and McCartney would work in partnership, as McCartney later commented: “I had ‘She was just seventeen,’ and then ‘never been a beauty queen’. When I showed it to John, he screamed with laughter, and said ‘You’re joking about that line, aren’t you? '” “We came up with, ‘You know what I mean.’ Which was good, because you don’t know what I mean” (Barry Miles. Paul McCartney: Many Years From Now), “It was one of the first times he ever went ‘What? Must change that…’” Lennon said: “That’s Paul doing his usual good job of producing what George Martin used to call a ‘potboiler’. I helped with a couple of the lyrics.” (David Sheff. John Lennon: All We Are Saying). The songwriting credit on the Please Please Me liner notes is “McCartney–Lennon” which differs from the more familiar “Lennon–McCartney” that appears on subsequent releases. The first live recording (a slow version of the song) was made at the Cavern Club at the end of 1962. Lennon didn’t play rhythm guitar; he played harmonica in the introduction and during the verses. Lennon and McCartney laughed when they sing “Well we danced all night/ And I held her tight/ And I held her hand in mine” second time. The song was recorded at EMI Studios on 11 February 1963 and engineered by Norman Smith, as part of the marathon recording session that produced 10 of the 14 songs on Please Please Me. The Beatles were not present for the mixing session on 25 February 1963. It was not common practice for bands to be present at such sessions at that time. On the album, the song starts with a rousing “One, two, three, four!” count-in by McCartney. Usually, these count-ins are edited off the final audio mix. However, record producer George Martin wanted to create the effect that the album was a live performance: “I had been up to the Cavern and I’d seen what they could do, I knew their repertoire, and I said ‘Lets record every song you’ve got, come down to the studios and we’ll just whistle through them in a day‘”. Martin took the count-in from take 9, which was considered ‘especially spirited‘ and spliced it onto take 1. Music journalist Richard Williams suggested that this dramatic introduction to their debut album was just as stirring as Elvis Presley’s “Well, it’s one for the money, two for the show…” on his opening track, “Blue Suede Shoes“, for his debut album seven years earlier. In addition it also made the point that the Beatles were a performing band as, at that time, they opened their live set with this song. On the first American release of the song, issued on Vee Jay Records, the count was edited out—but the “Four!” is still audible. The full take 9 version of the song appears on the Free as a Bird CD single as a B side, released for the first time. McCartney included “I Saw Her Standing There” on his live albums Tripping the Live Fantastic (1990), Back in the US (2002) and Back in the World (2003). In 1987, he recorded a new version for his album CHOBA B CCCP, but left it to outtakes. 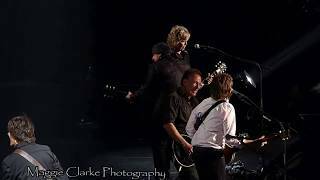 The song has become a mainstay of McCartney’s live sets, and a special version was played when McCartney and his band returned to Liverpool in June 2008. It featured special guest drummer Dave Grohl, the lead singer of the Foo Fighters. 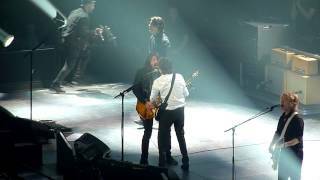 McCartney performed “I Saw Her Standing There” at the 1986 Prince’s Trust Rock Gala, as part of the 10th anniversary celebration of HRH Prince Charles’ charity. He was supported by an all-star band featuring Elton John, Eric Clapton, Phil Collins, Mark Knopfler, and Ray King. . Interviewed at the time, McCartney said: “It is a good thrill playing with musicians of this calibre … since it was a birthday thing, they wanted to do something silly at the end, and that’s me! !” This performance was released to iTunes Stores in October 2009 as part of the Digital Video Singles label. 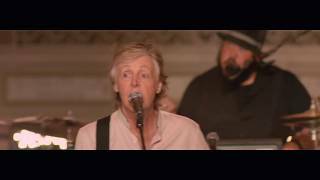 Paul McCartney also performed a duet of this song with Billy Joel during the inaugural concert at Citi Field in Flushing, New York. [a] mono 25 Feb 1963. edited. UK: Parlophone PMC 1202 Please Please Me 1963. US: Vee Jay VJLP 1062 Introducing 1963. CD: EMI CDP 7 46435 2 Please Please Me 1987. US: Vee Jay VJSR 1062 Introducing 1963. [b1] stereo remixed from [b] 1963, by Capitol. US: Capitol ST 2047 Meet the Beatles 1964. [b2] mono made from [b] 1963, by Capitol. US: Capitol 5112 single 1964, Capitol T 2047 Meet the Beatles 1964. The countdown is edited in from another take (see next entry). The original stereo [b] has a drop in volume in verse 3 near “we danced through the night” which is corrected in the remix [b3], which also has the two tracks brought slightly to center. On the Vee Jay albums the “1 2 3” is cut off on both [a] and [b], as if the countdown were extra material to be trimmed, although the “4” remains. Does this mean Vee Jay’s entire mono LP is just a reduction of the stereo mixes, or did they just do the same trim twice? But their mono mix does not have the volume drop characteristic of the stereo mix (see above). So how could I dance with another? 2:32 • Radio show	• L2 • For their second appearance on Easy Beat, they selected the song that kick started their debut album. 2:52 • Alternate take	• C • Take 9. The 1963 master of "I Saw Her Standing There" was Take 1, with Paul's energetic "1-2-3-4" count-in from Take 9 tacked on the front. Issued here for the first time is the full Take 9. “I Saw Her Standing There” has been played in 445 concerts and 4 soundchecks.